Very interesting article and I congratulate Prof. Fossum and Ms. Anagnost on their continued good work in the area. I do question the presentation in the comparison table. 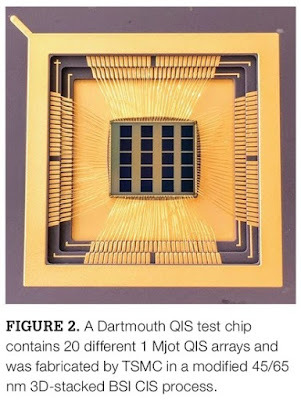 Both the CIS QIS and the EMCCD are produced in state of the art image sensor processes, and the comparison suggests that the CIS QIS is lower noise (DCR = 0.16 Hz). However, the difference in dark noise is solely due to the pixel size difference, and the DCR rate scales directly in proportion to the pixel area, as expected. This means the EMCCD does not have more dark noise than the CIS QIS. And, I believe the EMCCD has a wider dynamic range, though that is not indicated in the table. Regarding dark current or DCR, you said "the difference in dark noise is solely due to the pixel size difference, and the DCR rate scales directly in proportion to the pixel area" In fact, as I am sure you know from your own SPAD work, at smaller pixel sizes, DCR does not scale with area as it tends towards more of an edge (perimeter) sort of effect. Further, I don't know how our pixel DCR scales with area nor do I know how the EMCCD pixel scales with area, so we can only report the per pixel DCR. EMCCDs also have two kinds of cells, detection (low dark current) and multiplying transfer cells (higher dark current due to fields). The Impactron is a very interesting and cool device (no pun intended), but it may be forced into a smaller niche. You also imply that dark noise is just DCR. I think in the EMCCD at least, and certainly for CIS image sensors, dark noise (i.e. noise measured in the dark) has many components. 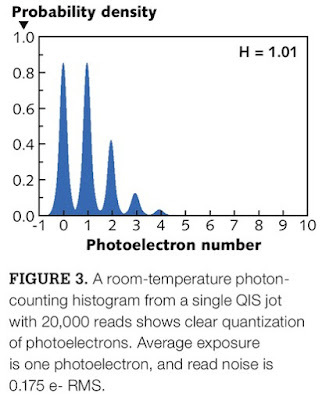 Regarding dynamic range, the EMCCD in photon counting mode is inferior, for sure, to QIS. This is due to noise in the avalanche process which makes photon number determination difficult. Turn off the avalanche in the EMCCD, and then it behaves more like other CCDs with similar DR to other CCDs. QIS can also be operated in high DR mode, as discussed in some earlier papers, achieving 120dB or higher using techniques now experimentally demonstrated with SPAD-based QIS (Neale Dutton and others). Regarding power, not sure how we missed the power in the referenced SPAD paper, so thanks for pointing that out (and sorry Neale). If you compare full power to full power, it is 26mW compared to 160mW. The number you cite might just be the SPADs detectors themselves and not readout. If you compare FOM, it is about 24pJ/b compared to 104pJ/b (using ref 5's FOM). As mentioned in the paper, if you are doing time resolved photon-counting, it is hard to beat SPADs, either in silicon or in III-V's as you may be working on. Lastly, I note this is a trade magazine article reporting the work done at Dartmouth and later at Gigajot by many students and collaborators in whose footsteps Kaitlin will follow. Thanks to all of them.